Next, I started sprint planning. 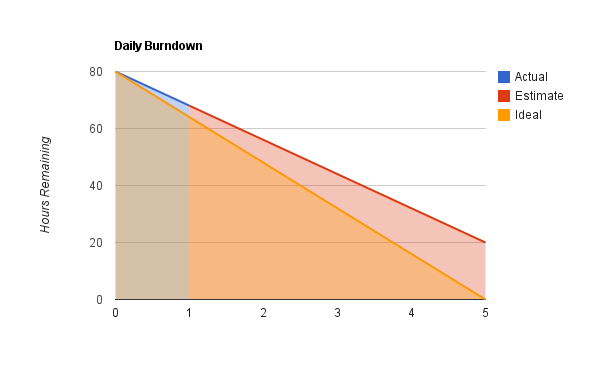 Since this was my first sprint, I needed to create a sprint doc to capture all of the user stories, tasks and time estimates, as well as a burndown chart to measure my daily progress. I finished creating the document, then immediately filled it with a thorough list of tasks and estimates. You can view the final sprint doc here. After estimating the final task, I looked at the summary and found a daunting figure. I had estimated 80 hours of work. In a typical one week sprint, I would allow a team member to commit to 15 to 20 hours. 80 hours represented a full work month, and I only had 5 days. The high estimate was a result of the granularity of the tasks. I do not allow any estimates less than 1 hour, and break user stories down into fine details. I was frightened, but undeterred when considering the 80 hour workload. Even though it was a mountain of estimated work, I would need several sprints worth of data before I could accurately measure my velocity. Next, I tried to put up a sprint board, but was hit with another setback. I bought materials and started setting it up, but the sticky notes kept falling off my kitchen wall. I went back, purchased a different brand of sticky note and produced the same result. An hour and a half wasted, I abandoned the idea of a physical sprint board. If this sounds like trivial, I disagree. This example illustrates why I estimate that an individual can do 5 hours of work in an 8 hour work day. We are notoriously bad at estimating time required to complete tasks, and tend to always imagine ideal conditions when forced to estimate. We always collide with unexpected setbacks, unplanned meetings, ad hoc conversations or longer then intended coffee breaks. There may be 8 hours in a work day, but they are never 8 productive hours. I finished my day by watching intro tutorials on Ableton. Within two hours using a new, complex piece of software, I was able to write 16 measures of drums, bass and lead, and export it to a wav file. They were 16 measures of bad music, but quality was not the purpose of the task. Despite the setbacks and time lost earlier in the day, I finished the day proving that I could use Ableton to create listenable product. It was a huge win.